Copenhagen, Denmark’s capital, and Oslo, Norway’s capi­tal, succumbed to Ger­man in­vaders on April 9, 1940, the first day of Oper­a­tion Weser­uebung. Though planning for Weser­uebung had begun the pre­vious Decem­ber, Adolf Hitler did not order full speed ahead until Brit­ish war­ships entered the terri­torial waters of neu­tral Nor­way in Febru­ary 1940 and freed some 300 sai­lors who had been cap­tured by the Ger­man pocket battle­ship Admiral Graf Spee sev­eral weeks ear­lier. Hitler’s in­va­sion of Nor­way osten­sibly was to fore­stall the planned Anglo-French occu­pation of that coun­try. Indeed, Ger­man envoys to Copen­hagen and Oslo made the case that the Wehr­macht’s move was to pro­tect the neu­tral­ity of both Scan­di­na­vian coun­tries. (The occu­pation of Den­mark was based on geo­graphi­cal con­sid­er­ations: its loca­tion facili­tated greater air and naval con­trol of the North and Baltic seas.) In truth, the goal of the Ger­mans in Nor­way was to secure Nar­vik, the ice-free port and rail termi­nus for Swed­ish iron ore exports to Ger­many, at the moment vital to the Ger­man war effort. Great Brit­ain and France, the latter nation a month shy of being in­vaded herself, re­sponded to Oper­a­tion Weser­uebung with their own landings in cen­tral Nor­way five days later. The ini­tial engage­ment of Brit­ish and Ger­man forces on April 21 was the first ground action between the two nations since World War I and it did not bode well for the Allies. A week later Lon­don, with­out warning its Nor­we­gian com­rades-in-arms in ad­vance, ordered Brit­ish forces to eva­cu­ate cen­tral and south Nor­way. On this day in 1940 Nor­we­gian and French forces took the offen­sive on the north­ern front near Nar­vik. Though holding a strong nume­ri­cal advan­tage over the Ger­mans, the Allies were none­the­less prompted to with­draw every­where from Nor­way after Allied defeats in France in May and June 1940 made it im­pos­sible to send rein­force­ments. King Haa­kon VII and his govern­ment, having estab­lished them­selves tem­po­rarily in Tromsø in north­ern Nor­way, reluc­tantly went into exile in Eng­land hours before the last Allied troops departed the coun­try, leaving Nor­we­gian forces to capit­u­late to the in­vaders on June 10, 1940. After 62 days of fighting, Nor­way was con­signed to share the fate of Czecho­slo­va­kia and Poland in 1938–1939 and now in 1940 with France herself. Left: Narvik provided an ice-free harbor in the North Atlan­tic for iron ore trans­ported by rail from Sweden’s Kiru­na ore mine. Both sides in the war had an in­terest in denying this iron supply to the other, setting the stage for a re­sump­tion of large-scale land battles following the Ger­man and Soviet in­va­sions and annexa­tions of Poland eight months earlier. Right: The total number of Norwe­gian defenders during the Battle of Nar­vik (April 9–June 8, 1940) was 8,000–10,000. 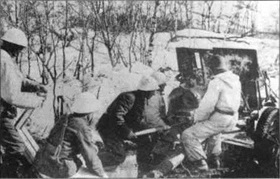 French, British, and Polish forces in and around Nar­vik brought the total Allied force to 24,500 men. Facing them were 5,600 Ger­man sol­diers, para­troopers, and ship­wrecked sailors. Left: The Battle of Narvik, which started with the Ger­man cap­ture of the vital rail ter­mi­nus and har­bor in Nor­way’s north at the start of Oper­a­tion Weser­uebung, pro­vided the Allies with their first major land victory in World War II on May 29, 1940. 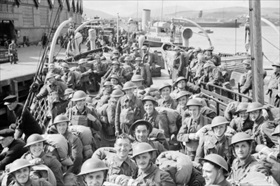 Right: However, the successful German attack on France in May and June 1940 forced the Allied expe­di­tionary force to eva­cuate Nor­way, which these British sol­diers did in June. Without Allied air and naval sup­port, Nor­wegians at Nar­vik were forced to lay down their arms, which they did on June 10, 1940, the last Nor­wegian forces to surrender their country to the invaders.